Lord Howe Islands in Australia is one of the world’s most famous tourist destinations, an island paradise which is situated 660 km from the east coast of Australia and is way out in the middle of the Tasman Sea. The duration of travel to the island by a short flight is less than two hours from Brisbane,Port Macquarie or Sydney. Private planes fly from all parts of the Pacific, New Zealand and Australia and the island’s cargo ship leaves from Port Macquarie every fifteen days. It has been named after a British admiral, Lord Howe and around 350 inhabitants have made it their home and several have descended from families who had settled on the island in the 18th century. Its tropical ambience with breath-taking view is a sheer delight to any tourist visiting this location which will give one the understanding of why this island has been called Australia’s last great paradise. Lord Howe Island has been listed as a World Heritage site for its remarkable natural beauty, geology together with rare collection of birds, plants and marine life and is surrounded by the world’s southernmost coral reef. 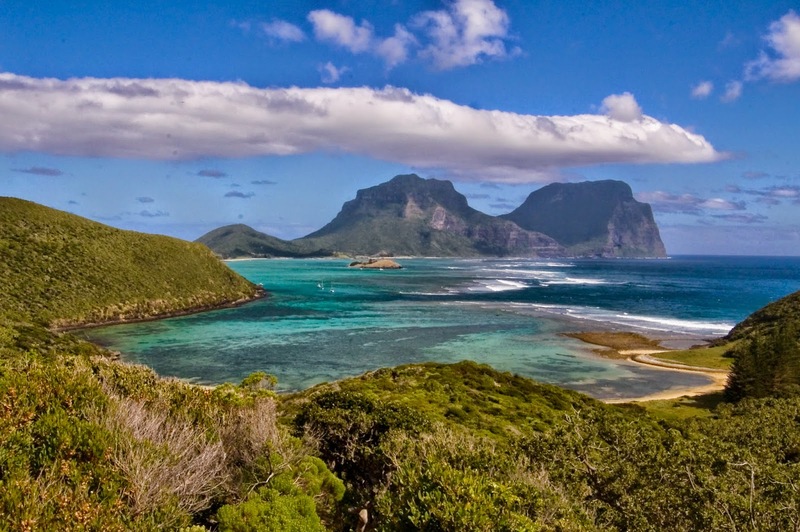 The translucent waters with the combination of marine life as well as the rare coral make up Lord Howe Island Marine Park which is one of the largest in New South Wales. The island is the remnants of a large volcano that erupted from the sea floor for about 500,000 years in the late Miocene. The island group represents the exposed peaks of the large volcanic eruption that is about 65 km long and 24 m wide rising from ocean depths to over 1,800 m. There are also four separate ranges of volcanic rocks which are recognized on the main island group namely, tuffs, breccia, and basalts with widespread traces of basaltic dykes. The main land forming process on the island from the last volcanic eruptions was marine erosion which has cut and maintained major cliffs. The island is an apt location for those interested in fishing as well as for snorkelers and scuba divers. Blinky Beach is the most appropriate place for Australian salmon while Neds Beach would be good for snorkel and also the opportunity to hand feed fish here. Tourist could also enjoy a variety of other water sports like kayaking, surfing, stand up paddle boarding, kite surfing and windsurfing. One can have a relaxed stay here and getting around the island can be done on foot or by bike with plenty to explore. The island is famous for its twin peaks together with its natural forest, which is an awesome experience for hikers and walkers. It is also one of Australia’s amazing bird watching locations where you get the opportunity to glimpse the island’s 130 permanent and migratory bird species or 64 species of flowering plants. Tourist could also contemplate on a guided climb of Mount Gower of 875 m which is considered as one of the world’s best hikes or one could take a serene leisure walk under the evergreen forest canopies in the Valley of Shadows.